Our school is named Cosmos Tokyo, because it is where we are: in Tokyo. But what about the history of Tokyo? It wasn’t the capital all the time, and wasn’t there something called the Edo Jidai. How did Edo change into what we know today? The system of Sankin Kôtai, or “alternate attendance”, brought many Daimyos to Edo, together with their samurais and vassals, sometimes for long periods of time. This large presence of Samurais contributed largely to the character of Edo, which set it apart from Osaka and Kyoto. 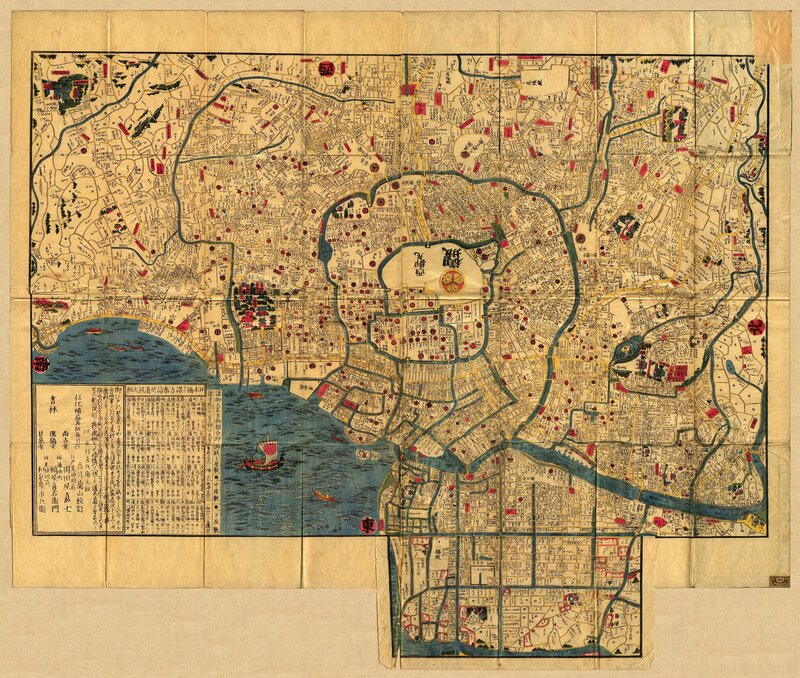 None of the other two cities were ruled by a Daimyo, or had such a large presence of Samurai. Kyoto was mainly dominated by the imperial court and the Buddhist temples, and Osaka was the country’s commercial centre, and therefore dominated by the merchant class, or chônin (町人). The “centre” of Tokyo was Nihonbashi (日本橋, “Japan bridge”). 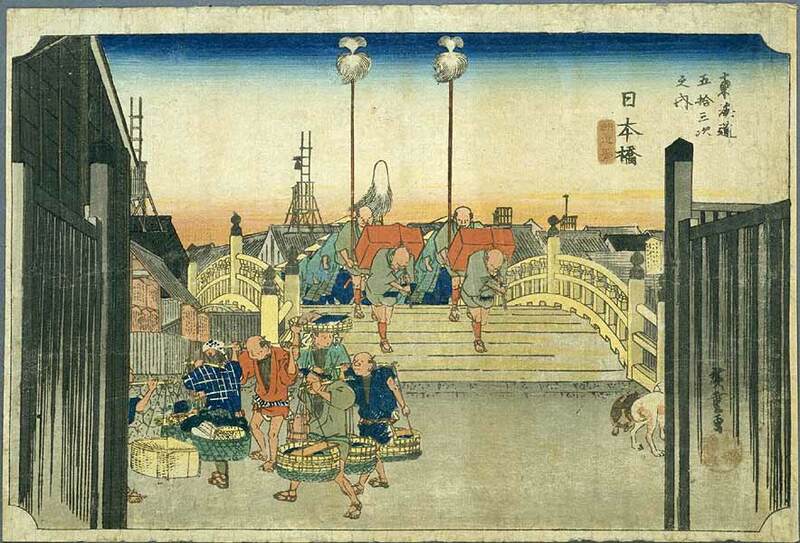 This bridge was, and still is, in the commercial centre of Edo, an area known as Kuramae (蔵前, “in front of the storehouses”). Here fishermen’s, tailors, craftsmen and other merchants would sell and buy goods and produce. This good were either coming in to Edo, or going out from it, on either ships to Osaka or other cities, or along one of the five main roads of Japan. Two of these main roads that connected the country are Tôkaidô (connecting Edo with Kyôto) and Hokkaidô (connecting Edo with… well the north). These main roads were all considered to have their start at Nihonbashi. Edo was the centre for the Shoguns power from the establishment of the Tokugawa bakufu (幕府, “government”) until the fall of the bakufu, known as the bakumatsu (幕末, “end of government”). Since it was “only” the Shogun, and not the Emperor, it wasn’t the capital. That right was reserved for Kyôto. After the bakumatsu, in the second year of his reign, the emperor Meiji moved to Edo, and the city changed name to Tôkyô, or “the eastern capital”. If you want a more detailed look into the life in Edo, and how it developed and turned into the Tokyo we know today, I really recommend a visit to the Edo Tokyo Museum in Ryogoku.